Our home is both a base to explore this beautiful and fascinating part of the world and a comfortable place to relax and have fun. The ½ mile paved driveway is perfect for leisurely walks and allows easy access for two-wheeled drive vehicles. The 4000 SF home on 35 acres is adjacent to national forest land. This comfortable home’s design is perfect for several configurations of guests or families. Up to five adults can enjoy private sleeping areas. Bedrooms with king or queen beds are available for up to three couples. This two-level house is perfect for guests who wish to use more than one floor (like adults with older children or individuals who want a bit more private space). The upper level includes bedrooms/baths, the family room/kitchen/dining area, and a utility room; the lower level includes bedrooms, bath, and a large activity area. Television and movies are available on both floors. In most rooms of the house you will enjoy inspiring mountain vistas. Fall foliage can be a brilliant display on the surrounding property and at varied distances. Mountain laurel and dogwoods decorate the spring landscape, and summertime comes alive with activities throughout the region. Nearby attractions include everything from rigorous outdoor adventures to endless sightseeing and shopping opportunities. Even without leaving the house, guests can enjoy games, reading, rest, or television/movies. On darker nights, the stars are often spectacular. Shooting stars are familiar sights on clear nights from the vantage point of the hammock on the deck. On evenings with a moon, the telescope provides for excellent observation. This wide range of available activities ensures wonderful options regardless of your interests, budget, physical condition, or even the weather. The home was custom built for us in 2004 as a place to eventually retire. In the meantime, we're pleased to share its comfort, beauty, and conveniences. Pleased be warned, however, once you're there, it's difficult to leave. Central heat & air conditioning upstairs. Downstairs level stays comfortable year round. Ceiling fans through out the house. Attic fan can also pull in cool evening air during warmer seasons. Central heat upstairs. Gas and electric heaters downstairs. Wifi for Internet browsing & phone service. Not suitable for streaming movies, etc. Large family room upstairs with fireplace, media center, and game table. Equipped to serve large families. Dining table seats 6-8. Game table seats 4. 37' flat screen TV upstairs with satellite service and Blu-ray/DVD/CD player. Downstairs TV has satellite service and DVD/video player. Local attractions and history. Novels. Game room downstairs features a ping pong table and room to children to play. Large wrap-around porch/deck with furniture. Large deck on two sides of the house (south & west). Central west portion is a covered porch. Several courses in the area. Outdoor features—Dining & other furniture on the deck including a large hammock. Play area with two swings outside of lower level. Logging road to upper portion of property for moderately strenuous hikes. The 'house side' of the property is bounded by national forest. Communication—Signal booster in the house offers generally good to excellent cell/smart phone & digital coverage depending on your provider. 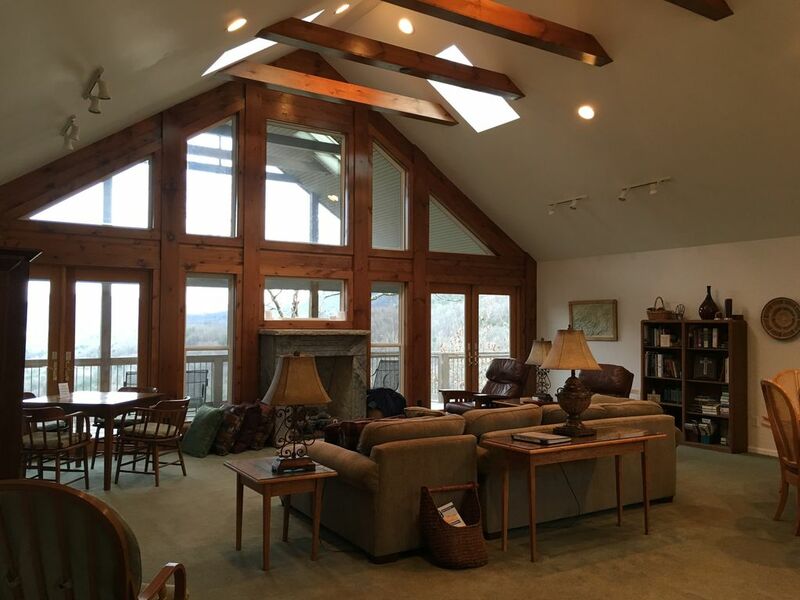 View-location—Spectacular view of woods and mountains on 35 acres of forest. Despite the privacy, the house is only 3 miles from Highway 23/441 and easily accessible to western North Carolina. Telescope is great for viewing the landscape and nightscapes. Another amazing stay at a beautiful home! This was our second time staying in this beautiful home. I highly recommend this home and area. The home itself is amazing and the views from the deck are breathtaking. There are many gorgeous waterfalls within driving distance, some great hikes, and some great restaurants downtown Franklin. We were able to catch a few sunsets from the deck, stargaze from the hammock, and just relax and kick back in this peaceful cozy home. Each moment felt like a gift, and we felt blessed to be here. We thank you for sharing your slice of Heaven with us. We so enjoyed our stay, and hope to come back again! tub, pool table and children's toys downstairs in such a spacious great room. Hurry up and get there with your dearest family or friends. If you want beautiful mountain views along with privacy, this is your place! We definitely will return. We were very impressed with the home. The setting was perfect, giving us a gorgeous view of the mountains, which we did not want to leave. When we did , Franklin was an easy drive. The home was wonderfully equipped and comfortable. We thoroughly enjoyed relaxing and being with family. We highly recommend this property for anyone who wants to have a great getaway in the mountains. Wonderful Home with beautiful, breath taking views! My husband and I celebrated our 30th anniversary in this amazing home. We spent 7 nights and we didn't want to leave! We were amazed and in awe from the moment we drove up the steep driveway, and realized we were truly at the top of a mountain. Then the beautiful interior of the home, and the amazing view from the deck had us overjoyed. We enjoyed the sunsets and the night skies from the deck. We loved sitting on the deck with a glass of wine at sunset, and laying in the hammock shortly after to view all the stars. We were blessed to see a shooting star. You can tell a lot of thought went into the design of the home with all the amenities. We found ourselves saying, "they thought of everything." From all the extra little lights and outlets, to the Master bedroom and bathroom. Lots of little extras and conveniences. I also so enjoyed sitting in the chaise lounge with my cup of coffee in the morning looking out at the mountains. My coffee hasn't been the same since! My husband enjoyed hiking up the logging road on the property, soaking in the beauty around him. Very peaceful and serene. He said it feels very remote, with a back country feel. My husband also appreciated all the local resources and maps in the home to help us plan our daily adventures. And adventures there were! There is much to see in the area, our favorite being the water falls on the drive from Franklin to Highlands. Especially the Cullasaja Falls. And a drive up to the top of Waya Bald is worth the scenic views, as well as walking on the Appalachian Trail once you are up there. We would both highly recommend this home and we hope to come back next year. Many great memories were made and lots of beautiful pictures taken. Booking with Vickie was easy and we appreciated all her help and quick reply to all of our questions. Thank you! If I could, I would give this home 10 stars! Great place to stay at, view was breath taking. Special Area Venues— Great Smoky Mountain National Park, Cherokee Indian Reservation, Smoky Mountain Railway, Nantahala Outdoor Center, Appalachian Trail, Blue Ridge Parkway, Biltmore House, Fun Factory in Franklin, Dollywood. Maximum 6 people No pets of any type No smoking on the property Thank you.